Compare discounts for Hotels Motels in Seattle, Washington! On the northeastern corner of the continental US, Seattle is one of the most vibrant cities in North America. Home to software giant Microsoft, Cappuccino Coffee culture North American pioneer Starbucks, Aircraft industry mega-power Boeing, Grunge music icon Nirvana, Seattle is maybe far away from most American cities in terms of mileage but its influence runs deep. Located along the shore of Elliott Bay, with Lake Washington to the east and the snowy peak of Mount Rainier in the background, Seattle is a lovely city to visit. Downtown and the Seattle Center areas are compact, easy to navigate, offer free public transportation and are packed with attractions. The suburbs and Seattle surrounding areas offer numerous recreational activities, world-famous wineries and wonderful scenery. Note: Lists are not identical. 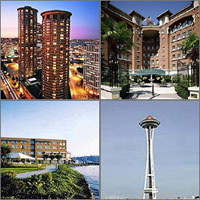 Different sites offer different accommodation options for Seattle. The Bellevue Club Hotel is an elegant, 67-room hotel set on 9 acres located only one mile from downtown Bellevue and 10 miles east of Seattle, WA. W Hotel Seattle is located close to prime business and tourist attractionsÃ¢â‚¬â€just four blocks from Washington State Convention and Trade Center and five blocks from Pike Place Market. Recently voted no. 19 for Top 100 Hotels in North America by Travel and Leisure Worlds Best, the Inn at the Market is a four diamond rated hotel overlooking Elliot Bay and Pike Place Market. Opened in 2000, the Willows Lodge is located on 5 acres on the Sammamish River in in Woodinville wine country, 18 miles east of Seattle and 11 miles from Bellevue. The Italian Renaissance-inspired Sorrento Hotel is a historic hotel opened in 1901 located on Seattle's First Hill. The Westin Seattle has a prime downtown location near shopping, restaurants, and cultural activities. The Grand Hyatt Seattle is located in the heart of downtown Seattle directly adjacent to the Washington State Convention Center. The Hyatt Regency Bellevue is a 24-story hotel located in downtown Bellevue, across the street from the Bellevue Square shopping mall. The Seattle Alexis Hotel is a European-style hotel located only one block east of the ferry terminal and the waterfront and four blocks from Pike Place Market. The Sheraton Seattle Hotel and Towers is located within strolling distance of downtown attractions, entertainment and restaurants. Just a stone's throw away from magnificent Elliott Bay, the new Seattle Marriott Waterfront is prominently situated within Seattle's thriving waterfront community and is adjacent to the seventy-eight thousand square foot Bell Harbor International Conference Center on Pier 66. The Woodmark Hotel, located in downtown Kirkland, less than 20 minutes from Seattle, Bellevue and Redmond, is the only hotel on the shores of Lake Washington. The vineyard-inspired Hotel Historic Vintage Park is a boutique hotel located in downtown Seattle financial district near shopping and only one block from the 5th Avenue Theater. Hotel Monaco Seattle is a stylish 189-room located only 2 blocks from the Seattle Art Museum and 5 blocks from Pike Place Market and the waterfront. The Hotel Andra is a chic boutique downtown hotel with modern charm, located on the edge of the hip Belltown neighborhood just 4 blocks from Pike Place Market.